Be Naughty from Lizzie Kate is stitched on 16ct or 32ct Natural with a stitch count of 103w x 33h using 4 Weeks Dye Works and 1 Crescent Colour fiber with DMC/Anchor conversion. 3 small red buttons are included to spark up the design. Dance in the Rain, an Inspiration Boxer from Lizzie Kate is stitched on 30ct Natural Linen with a stitch count of 129w x 51h using Crescent Colours threads with DMC/Anchor conversion. Fabric, one charm and beads are included in the kit. A Bonus Pin Cushion pattern is included. 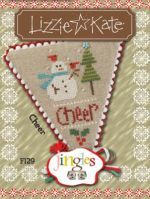 Jingles Flip It Cheer from Lizzie Kate is stitched on 30count Natural Linen or a fabric of your choice with a stitch count of 35w x 56h using 11 Weeks Dye Works fibers with DMC/Anchor conversion. 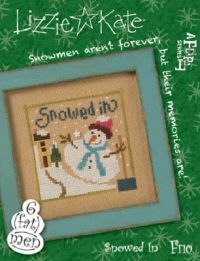 This pattern can be stitched and made into an ornament or stitched as one with the 11 other designs in this series. A button and beads are included with the pattern. 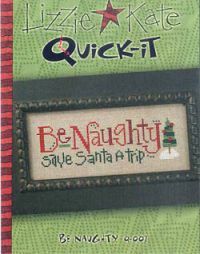 Jingles Flip It Merry from Lizzie Kate is stitched on 30count Natural or a fabric of your choice. The stitch count is 47w x 54h using 8 Weeks Dye Works fibers with DMC/Anchor conversion. A button is included with the design. 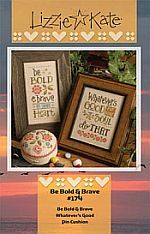 This can be stitched individually or with other 11 designs in this Flip It Series. 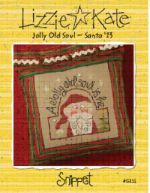 Jolly Old Soul-Santa '13, another of the yearly Santas from Lizzie Kate I is stitched on 14/28ct New Khaki with a stitch count of 80w x 79h using Weeks Dye Works, DMC or Anchor. A snowflake button is available. 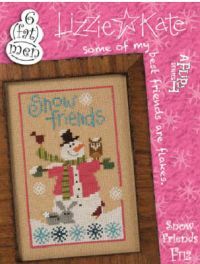 Snow Friends is the third of 6 Fat Men from Lizzie Kate and was stitched on 14/28count Amber with a stitch count of 53w x 86h using Crescent Colours and Weeks Dye Works. DMC and Anchor alternatives are provided. A white snowflake button is included. Snowed In the first of 6 Fat Men from Lizzie Kate was stitched on 14/28count Amber with a stitch count of 51w x 51h using Crescent Colours and Weeks Dye Works. DMC and Anchor alternatives are provided. A white snowflake button is included. 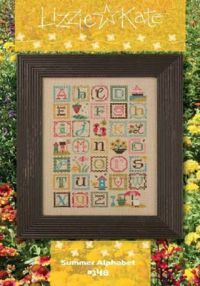 Summer Alphabet from Lizzie Kate is stitched on 16/32count Light Mocha with a stitch count of 111w x 159h using Crescent Colours, Weeks Dye Works and Sampler Threads with DMC/Anchor conversion.